I went through the .pdf catalogues available on the Ben Pearson website and cropped the logos from '57 to '73. The logo fonts and the type of broadhead change, so you can get an approximate range for Pearson items. There are a few year's catalogues not available or the file was corrupted, so they are not included. If someone comes across more, feel free to post it here. 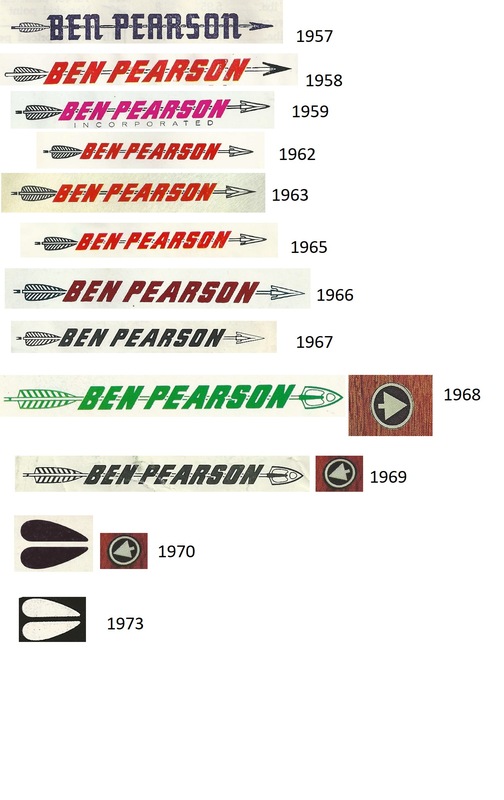 After 1969, the catalogues do not show a clear picture of the BEN PEARSON name on top of the arrow, but the bows appear to still have that type logo on some of the limbs; since the logo is not clear, I did not include them. I'm imagine there are other methods, but this is what I have found and decided to compile what I had found out so far. If I get some time, I will continue past '73. Here's one from an older 50s longbow.